If you love this website, you’ll love how easy it is to take your reading computer center up a notch with these YEAR LONG lessons ready to go. I’ve created the Computer Reading Center for Kindergarten: Common Core Phonics and Literacy just for kindergarten classrooms. 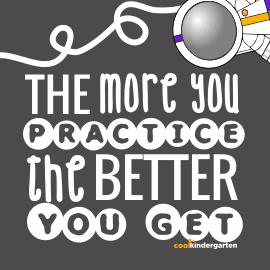 It’s simple to use just like Cool Kindergarten but with MANY more standards covered! Take them on an interactive reading adventure in this ‘traveling the world’ themed center. Standards-based interactive online activities, games and reading for kids to complete using the computer or laptops! This is an entire year’s worth of kindergarten READING computer center lessons ready to go. It hits common core standards in reading and English Language Arts. Perfect for using in centers, stations, guided reading or at the computer lab. Get your students learning DIFFERENTIATED phonics and literacy material while making it EASY on YOU! 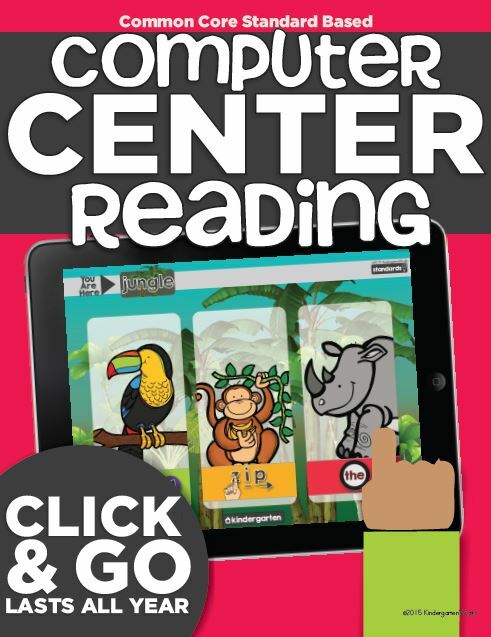 Lesson Pages “Reading Center” PDF – 64 Pages of online games/activities ordered to cover the entire K year! Easy for students to click and learn with little-to-some modeling. Content is divided into 4 reading terrains, and each terrain into 3 skill areas. There are are 7-18 items per skill area. See preview file for explanation and example. Skill areas: alphabet, reading basics, beginning sounds, ending sounds, rhyming, onset/rime and phoneme manipulation, short vowels, blending, sight words, digraphs, blends, mixed chunks, long vowels, r controlled vowels, two-vowel patterns, spelling. 48 Audio Stories – 4 Pages within the reading center PDF that each has 12 audio stories to reinforce reading concepts, fluency and *optional* gives early finishers an open-ended activity. 52 Task Posters – Use posters to easily show students what games/activities to play! 2 Customizable Task Lists – Create a list of activities you want students to play using the same graphics! Make differentiated lists for groups of students or even individuals. Use the 8 page PowerPoint file to type in student names and create a custom list with over 49 included graphics. You can differentiate as much or as little as you want! What a great resource!!! My kiddos are now able to be more independent on the computers!!! – Nicole G.
Read more about the Reading Center for Computers on my teaching blog KindergartenWorks. In two ways. One, coolkindergarten.com is a website. This product is a pdf. The second way is that this product covers every skill in depth or in multiple activity styles. For example, while Cool Kindergarten has 11 activity links to cover the alphabet and letters, the Reading Center has almost 200 links! They are all easily organized and accessible so it will never be overwhelming. Because of that, my favorite part, is the ability to differentiate at the level I want. I can assign the whole class to work on beginning sounds. Or I can just tell a reading group (small group) to work on beginning sounds, rhyming and/or ending sounds. Or I can even differentiate on the individual level – I can tell Ava to work on the letters R, T, F and beginning sounds. I’ve included posters and cards to help give visual directions at each level of differentiation. There is some overlap of the websites used – but each product has plenty of unique links and resources. Both the reading center and computer lab lessons guide students to specific levels of play for less specific websites to make it more laser focused and independent.